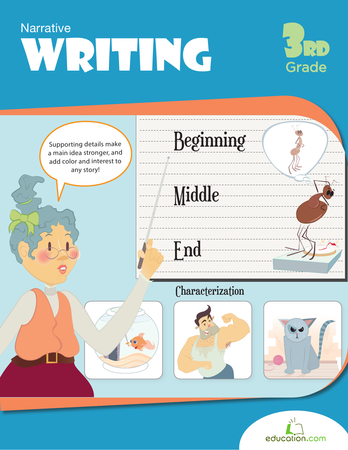 After this lesson, students will be able to identify the main idea and supporting details in a passage. The possibilities are endless. Choose themes that will resonate with your class. Begin the lesson by reviewing the definition of Main idea, or the most important topic in a text. Play the video Main IdeaBy Brain POP for your class. 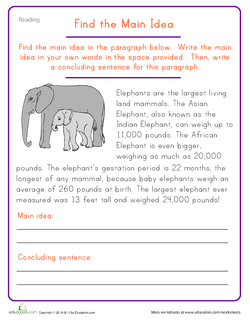 Once the video finishes, read the passage on the Main Idea: Elephants attachment to the class. 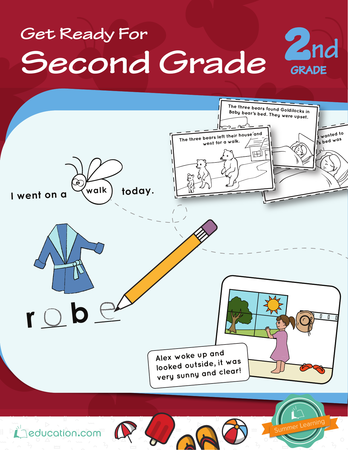 After finishing, highlight what the main idea is, using Supporting details, or facts, statements, or examples that help illustrate the main idea. 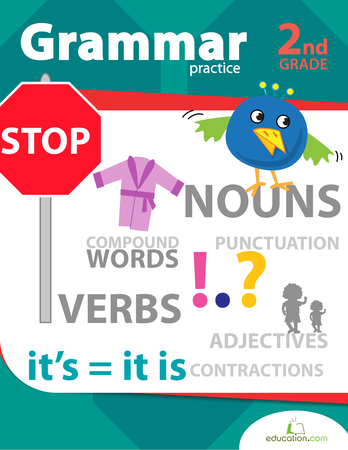 Summarize the main idea in a concluding sentence. Write the sentence on your whiteboard. Explain to the class that today, they will be split into groups to look through mystery bags of supporting details and determine the "main idea" of each bag. They will write a conclusion sentence that summarizes the main idea of each bag, and share their findings with the class. Explain to each group that they will be looking at the supporting details inside a mystery bag at each station to determine the main idea for each bag. 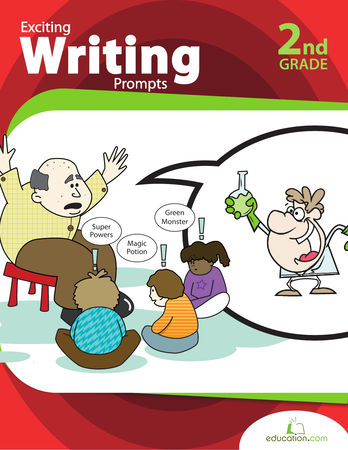 Remind the class that each group will have five minutes at each station to review the supporting details, agree on the main idea, and write a conclusion sentence. Using a model bag, demonstrate what your students are expected to do in each station. Take out the items in the bag one by one, and hold them up for the class to see. For example, take a pen, a pencil, markers, and crayons out of the bag. Conclude by giving your thoughts on what the main idea for this bag could be. For example, say that you think the main idea of the bag is Art tools. Ask your class for additional suggestions for the main idea of this bag. Encourage volunteers to use the supporting details as evidence for their suggestions. Write the students' examples on the board. 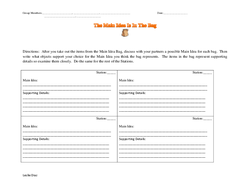 Remind students that they will have to work together to come up with the main idea for each bag. They will record their main ideas on their worksheets. Split your students into groups of four or five students. This will allow everyone to participate as well as keep the stations more manageable. 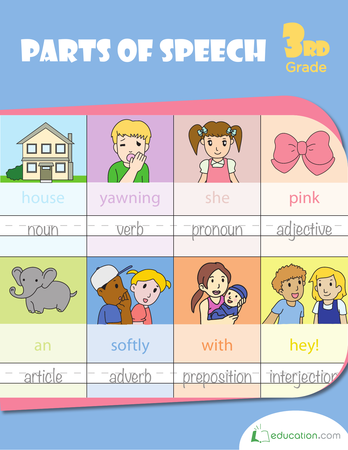 Pass out a copy of the Main Idea Recording Sheet to each student. Have each group go to a station, and begin working. As students work, walk around the classroom providing support as needed. Set a timer in five minute intervals. Each time the timer goes off, have students move to a new station. Enrichment:Have students that need greater challenge come up with supporting detail sentences using the items in the bag, in addition to the main idea conclusion sentence. Support:Give students that need extra help a list of main idea sentences, one that describes each mystery bag. These students should match each main idea to the correct mystery bag. 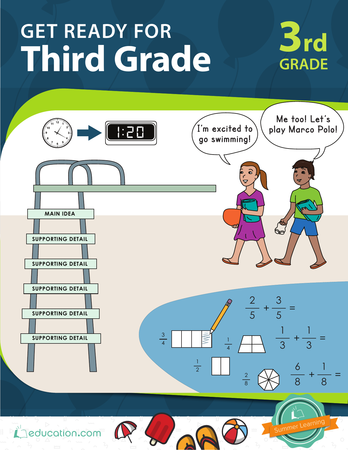 To assess student understanding during the course of the lesson, walk around the room to observe each student's understanding of the concept of a main idea. 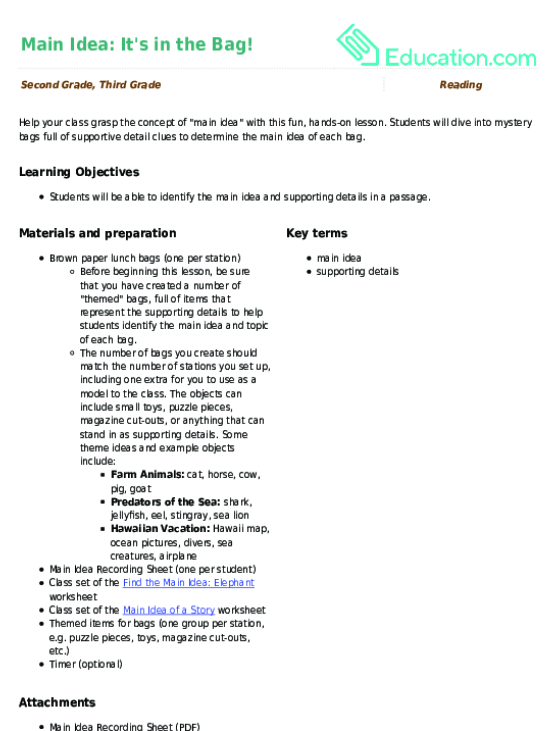 Collect the Main Idea Recording Sheets and determine whether or not students where able to define the main idea and write a sentence for each bag. 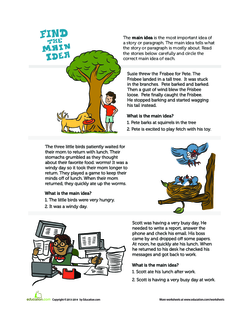 Give each student a copy of the Find the Main Idea: Animals worksheet to complete. Call the class together, and have the students take turns sharing their recordings for each mystery bag. 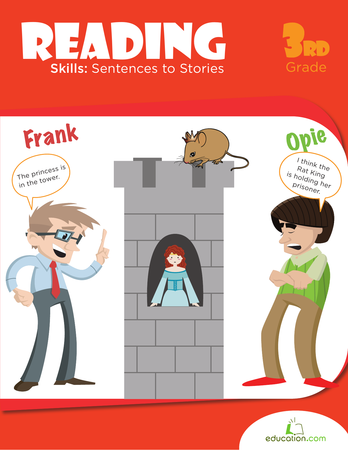 Allow your students to discuss any similarities or differences in each station. After the discussion, remind students that the main idea is the most important point in a passage, and that supporting details are facts that help support the main idea.